This section is about tips and techniques on various woodworking and DIY issues. I have learnt much from the blogs written by woodworkers around the world and I want to pass on something of that to the readers of this blog. There is no end to learning and the more I learn, the better my woodworking gets. "Measure twice, cut once", is an oft repeated adage that I have tended to acknowledge but not always practice. And sure enough, most of my mistakes have been due to poor or inaccurate measurement. Every time I bungle I curse myself and promise to measure twice if not thrice but every once in a while neglect to double check and end up with yet another cockup. So take the old adage seriously no matter how clichéd it might sound. The workbench with a wood vice and holes for bench dogs and stops is something of a necessity for a woodworker. I came upon a workbench alternative after weeks of experimenting and having completed it recently, found it good for most tasks. The idea is very simple: instead of building a permanent workbench, why not build a portable light duty bench substitute? Box joints are nothing but alternate slots cut on the edges of two pieces of wood so that they fit tightly together. I suppose they were originally designed to make strong boxes but I like their looks and am of the opinion they can be used in a variety of situations. 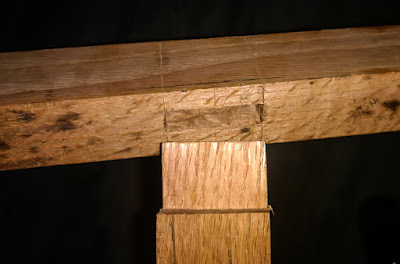 Sooner or later every woodworker must learn how to make mortise and tenon joints. These joints are required for a variety of situations, especially in many kinds of framework. Most shutters, doors and windows are made using this joint. I found that I had a large number of irregular pieces of plywood stacked all over the place and felt it would not be a bad idea to use up the pieces to build quick and easy shelves, racks and so on. 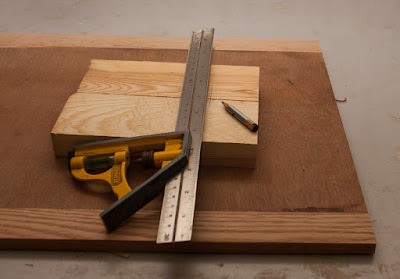 Apart from using up the plywood, this would give me much needed practice with plywood. The notion that furniture made out of plywood is inferior or cheap is not correct. A lot of beautifully crafted furniture has been made from plywood particularly those cladded with wonderful, exotic veneers. Plywood furniture made properly can be extremely strong and very long lasting. At one time I would throw all the scrap pieces of wood left over from projects. In winter these scrap pieces would go into the barbecue fire along with charcoal. Later I began to realise that there was no such thing as scrap – that most pieces could be put to good use. The screw is a much better and stronger fastener for joining two pieces of wood as compared to a nail or glue. The helical threads of the wood screw grip wood better and compress the two pieces to be joined tightly. I first ripped the raw planks to five inch wide strips, then glued two together to form ten inch wide planks. The pieces seem to have stabilized and I have tried my best to flatten them with my 18 inch long jointer plane. After flattening them the best I could, I used my smaller smoothing jack plane to further level out the surfaces. Some of us city folks do not have the space for the gear or the time to do what you are doing, but it is a great source of information. It is always good to know about such craft. If you don't mind I have a question regarding repairing old wood that has frayed away in places by water. What's the best way to fill the gaps and treat it? Many thanks for your comments., quite makes my day. About repairing old wood: I don't think there is any quick and easy method. I have a problem piece below my kitchen sink whoch I have been wanting to treat. Problem is that it is perpetually wet so treating it is all the more difficult. If your piece is dry, then perhaps the best way would be to make a mixture of epoxy and wood dust and mould it into the gaps and ends. I tried this but it did not bind properly as the wood was wet. Finally I used Mseal (the light grey waterproof one) to repair the wood. Mseal is also a kind of epoxy and one version works on wet substances and areas without any problem. The Box Joints are actually called finger joints. They look awesome. I'm a programmer, electronics enthusiast and maker. I try to adhere DIY ethics ideally. My entrepreneurial project is in need of a small size but creative wood work; essentially (wood carving). I have a question, my product is a union of two different material viz. carved wood, small plastic part. Already available color of used plastic platic part is disturbing the wooden theme of my product. Any, idea what simplest thing(s) can be done on that small part to give its upper layer a professional wooden texture look? 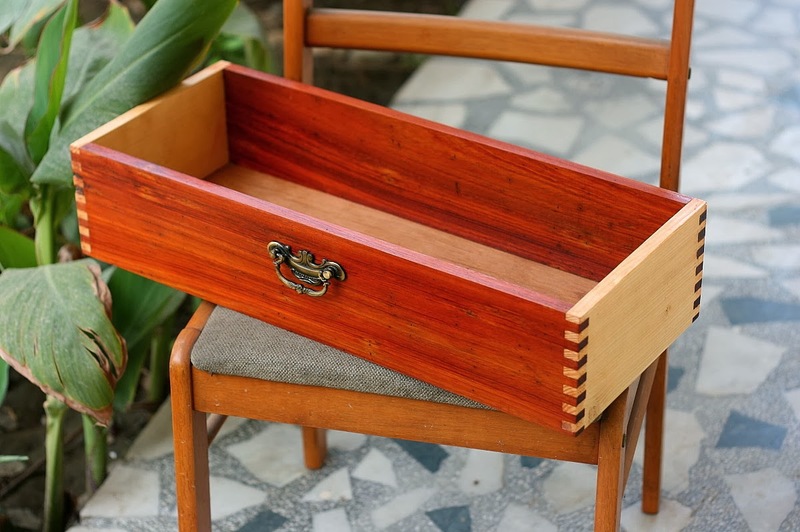 Last but not the least, your blog is niche in terms of all presently aspired DIY skills - wood working; which in itself a motivating factor for the needy ones. Further, writing it sincerely make it a valuable contribution to DIY community from your side. Dear Himanshu, the only way to do that would be to paint the plastic part to make it look like the rest of the wood. This would require some artistic skill but can be done. With a fine brush and some pigment you could mimic the grain pattern of the wood.